With all the bird seed choices bird lovers have these days, sometimes it’s difficult for customers to know what bird seed to buy. What it really comes down to is, what birds do customers most want to attract? Some people love all the birds, some people only want to feed smaller birds, while others want to keep pigeons and starlings away. Here Duncraft gives the details of the different seeds available and what birds are most attracted by them. By far the most popular of all the bird seeds and the one seed accepted by all seed eating birds. Black oil seeds have a soft shell and are easy for birds such as chickadees and titmice to open. They also have a high oil content which provides calories and energy all year long. Black oil seeds are also available as whole “hearts” which are the seed meat with the shells removed, or “chips” which are small bits of hearts. If customers want to offer only one seed, it should be black oil sunflower seed. Customers can expect to attract chickadees, nuthatches, titmice, woodpeckers, grosbeaks, cardinals, finches and more. Striped sunflower seeds are a large seed with black or gray stripes. They don’t have as high an oil content as black oil seeds and they’re harder for small birds to open. However, birds with beaks designed to eat big seeds, such as goldfinches, cardinals and grosbeaks enjoy the striped seeds as much as black oil seeds. Nyjer seed is often served alone in special feeders that hold these tiny seeds without allowing them to fall out. However, Nyjer can also be found in some mixes as well. 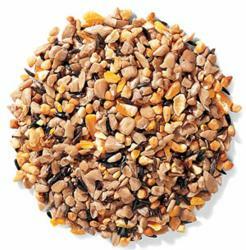 Nyjer seeds are a high-oil seed and are especially loved by finches such as goldfinches, redpolls, pine siskin, house and purple finches. Sometimes offered alone to deter squirrels, safflower seed is particularly enjoyed by cardinals, but may also be eaten by grosbeaks chickadees, titmice, nuthatches, mourning doves and buntings. Of the two types of millet found in bird seed mixes, red and white proso millet, the white proso is the most favored by birds. Millet is a small, round seed that especially attracts buntings, both painted and indigo, doves, juncos, and sparrows. Small pieces of corn are included in many mixes or can be purchased separately. The birds it’s most likely to attract are doves, sparrows, towhees, blackbirds, grackles, and jays as well as larger birds such as turkeys, pheasants and quail. Peanuts are high in oils and very nutritious for birds. They can be offered as bits, shelled or even whole peanuts. There are also special feeders that hold peanut halves and whole peanuts. Customer can expect to attract jays, woodpeckers, chickadees, nuthatches, titmice and more. Duncraft states that other seeds that may be encountered in a bird seed mix are wheat, milo, or canary seed. Canary seed is accepted by juncos and sparrows, but if for customers that live in the eastern part of the country, the wheat and milo will probably go to waste. These seeds are grown primarily in the midwest and eastern birds aren’t used to them. In addition to seeds, many mixes include tree nuts such as almonds, walnuts, pecans and pistachios as well as fruit bits such as dried blueberries and cranberries. Duncraft carries an extensive inventory of pure seeds as well as exclusive seed blends designed for general feeding as well as for attracting specific species. Founded in 1952 and located in Concord, New Hampshire, Duncraft’s objective is to bring the joy of backyard birding to wild bird lovers all across the country. Mike Dunn, owner and CEO is constantly inventing and searching for innovative ideas in bird feeding—giving bird lovers years of bird feeding enjoyment, success and satisfaction.